Painter/inventor Adam Licsko and I are chatting in a Los Feliz coffee shop about art, science, and his patented "Hip Thing" -- an elegant personal, load-carrying device -- when we instinctively stop talking. We glance around and see we're surrounded by people -- young, older, hipsters and suits -- who are all looking down at their tablets, laptops or smartphones. None of them are interacting with each other. None. One person actually looks like he's nodded off, right over his tablet. The scene illustrates the essential theme of Licsko's (silent "c") new series of oil on canvas paintings called "Remember Yourself." Licsko, a genial giant who nevertheless knows martial arts and survivalist skills, admits to loving technology, his big screen TV and videogames. But the son of two internationally renowned artist parents (Frank and Joanne), gets the bit between his teeth when talking about this series. "The accumulation of information is not who we are. With 'Remember Yourself,' I'm trying to get people to wake up, to remember they are a soul and not be so sucked into technology as an agent of sleep and complacency. Technology is awesome and cool but don't die getting mugged while crossing the street mid text message. You are worth more than that. We are spiritual beings not merely consumers." 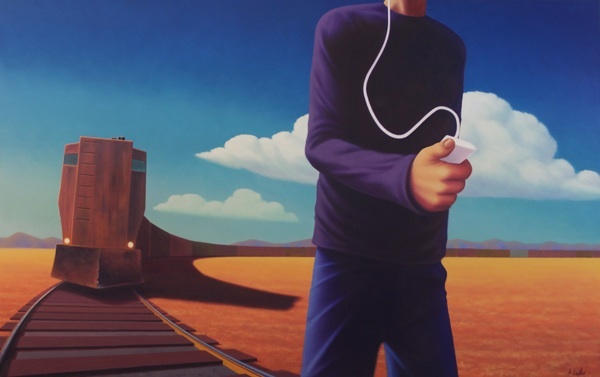 As if to further illustrate his point, we head to his studio where the first painting I see is "Clear as Day" a vibrantly evocative, 8' x 5' rendition of a dude with earphones on merrily walking along a train track -- he's totally oblivious to the approaching engine. "Life is like a freight train and can be unsympathetic. Distraction by the modern world is forgetting our selves and our sense of self-preservation. So please don't nod off," offers Licsko with a wry smile. 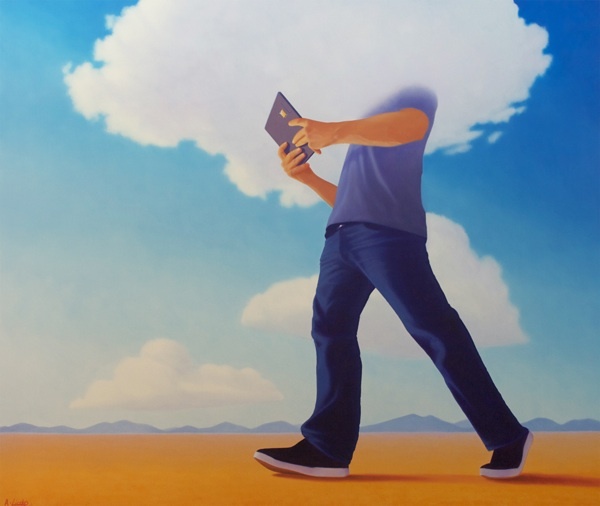 Other paintings in this stimulating series vibrate with a similar message like "Head in the Cloud," "Illuminated Man" and "Ascension" which depicts businessmen on the corporate climb. "The title 'Ascension' was carefully chosen as it's often applied to spirituality and I thought it ironic in this context. How we trample each other to get ahead." Not that Licsko has any problem with businessmen. In fact, he has corporate collections with Nissan, Loyola Marymount University, and State Farm among others. And, several of his collectors are senior executives from Raytheon (William Swanson), Cisco, Seagate Technologies and Amgen. "Tech guys dig my work, telling me they like art that says something. That it just doesn't suggest or abstractly infer -- it says!" The 37-year-old Licsko works in everything from pencils and inks to oils and he also sculpts. And he also doesn't have a bias toward any expression of art, sometimes "using abstracted techniques to create realism." But these days a lot of his work is suggestive. "Young people today are so used to the amazing visuals of videogames and 3D movies, that they don't care about abstract concepts. If you want to get their attention, say it loud and clear and stand by it." And what grabs my attention next is a provocative work-in-progress, the 6' x 4' "Kindling" which features a life-size radiant bonfire of... Kindle-like tablets. Licsko, who is a huge fan of the late writing legend Ray Bradbury and particularly his dystopian novel "Fahrenheit 451," wanted to vividly portray a modern "book" burning that evoked a "wake up" message. He first references that the burning down of the Royal Library of Alexandria destroyed 40,000 scrolls or more, resulting in so much of our ancient history, literature and learning being lost forever. Then he mischievously lets go. "Hey, I'm all for green thinking and saving trees. I love painting landscapes and I've even used nature reflected in cityscapes. But with more books becoming digital, what happens if the Net is switched off, who then controls all the world's knowledge, culture and humor? What if the only real books are in the Library of Congress and what if access to them is limited, who controls the flow of information? It is kind of scary." One of the tablets on his metaphoric funeral pyre has an image of Bradbury's "Fahrenheit 451," to which he further questions, "Strange that it's called Kindle which has to do with fire and burning. Why are you associating fire with books? Personally, I love the smell of books, the crack of a new spine. Digital books should be digital back up, not the main thing!" Speaking of, Licsko has recently self-published a deliciously naughty new book called Kama Sutra for One -- A handy self-help guide for both women and men. It stars genderless Sticksy and dispenses witty wisdom about self-love without ever once mentioning the "M" word. Author Salman Rushdie once said "all great art challenges the status quo." Trust artist Adam Licsko to keep unsettling that status quo... with a nudge and a wink!